In the on-demand service space, as it almost always does, the title of champion is going to go to the startup that gets all the little details right. There are certain trends gaining steam regarding app essentials that reflect consumer demands in this marketplace – the app must be mobile. Consumers want to find services on the go, at the spur of the moment, and mobile devices allow the most flexibility and convenience. All services should be represented. People are tired of using different tools to find different services, setting up accounts with different merchants, navigating individual merchant sites… Consumers want to be able to find, book, and pay for any kind of service both easily and immediately. Service providers want to fill their schedules, manage bookings, handle payments, using one service – automating the process as much as possible and without possessing much technical skill. Easy enough, but very hard to deliver. The basics may have been settled on, but who does it best has definitely been left up for grabs. JustGotThat! is a new on-demand service marketplace that helps consumers find, book and pay for any service in one simple mobile app. And it is a free, booking and reservation system for service providers where they can promote their availability. People can use JustGotThat! to find their ideal services based on value, proximity, availability and reviews. Likewise, businesses can use the app to leverage promotions and pricing, location, open time slots, and glowing reviews into more customers. 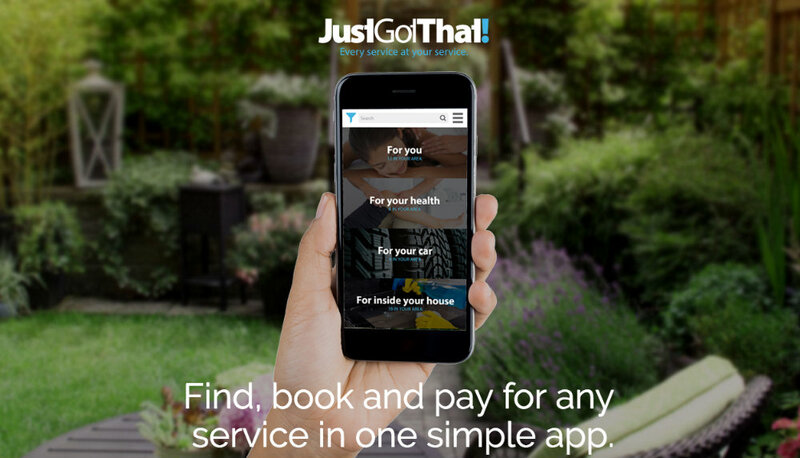 Personal health and fitness, home repair and maintenance, lawn care, automobile services, pet care – options in each of these categories and many others live on JustGotThat! While searches can be done locally, JustGotThat! also enables users to search using an alternate location. It’s worth mentioning that several apps in this space are limited to the immediate vicinity. JustGotThat! also distinguishes itself by allowing consumers to maintain their favorite service providers, track past reviews and bookings, and manage multiple locations and credit cards. In other words, the app is strong on the consumer facing side of things, having worked to provide maximum value, including the setting up of recurring services. On the side of the service provider, JustGotThat! lets merchants update their schedule in real time, and there’s no charge to advertise excess availability. (JustGotThat! only collects a fee when bookings are made in app). The platform is a great way for businesses to improve their visibility by reaching consumers on mobile devices, where consumers are rapidly migrating to purchase services. JustGotThat! also appears to avoid facilitating a lot of back and forth between merchant and client – as similar apps tend to do – which slows down the booking process and ultimately hurts the app’s appeal. Has JustGotThat! perfected the formula? Will the app deliver the speed, ease and business growth that will turn them into the preferred on-demand service marketplace? Currently available in the Toronto area, learn more about the app at justgotthat.com, or find the answer to these questions firsthand by downloading the app on Google Play or the App Store.